Few days back, many of you would have crossed my guest post for Friendship Chain event, a fabulous event started by Anamika of Taste Junction, here comes my turn to share with you all a incredible dish from a fantastic blogger briefly called as CL aka Cool Lassi(e) of Pan Gravy Kadai Curry,her space speaks a lot her love for cooking,with her stepwise pictures,none will go wrong to recreate her dishes at home..Its quite a fabulous chance for me to ask her to write a guest post specially for this incredible event, i was really happy for her immediate reply..A very big thanks to Cool Lassi(e) for sharing her regional cuisine with us.. 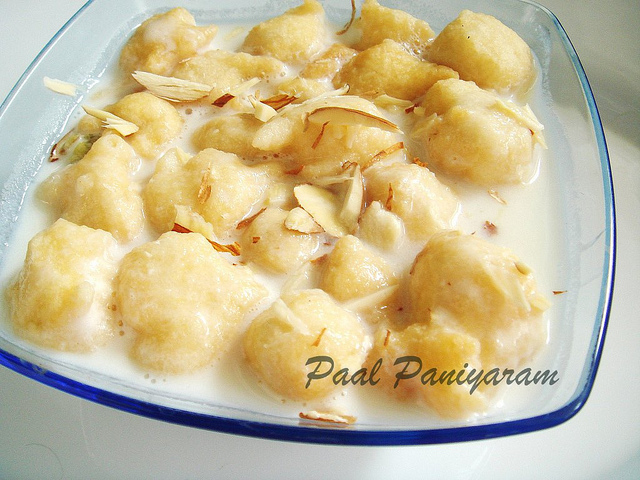 Here comes the wonderful and authentic dish for North Arcot serva as per Cool Lassi(e)'s words.. 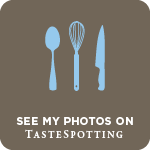 When Priya asked me to do a guest post for the "Friendship Chain - Spread the Speciality", started by Anamika of Taste Junction, I was immensely happy that she thought of me to carry forth the torch/link of friendship. And I simply couldn't say No. Priya is a blogger that I look up to. Her creativity knows no bounds and her consistency astonishes me. I simply want to be a fly on the wall in her house and observe how she manages time for family, creative cooking,blogging and blog-hopping. I strongly believe that her talent to juggle everything with such ease has earned her a loyal readership from all over the world. Hats off to Priya. And plenty thanks to her for giving me a chance to do a guest post in her super-cool blog. While it was very easy to say yes to do a guest post it was equally difficult for me to narrow down to just one traditional recipe. And that too one that Priya hadn't already thought of and blogged about.See my dilemma? I mean, Priya pretty much has covered most of the South Indian "Regional Specialties" with her enormous efforts, a true labor of love if you ask me. So it took me days to decide on a recipe indigenous to the region I hail from. 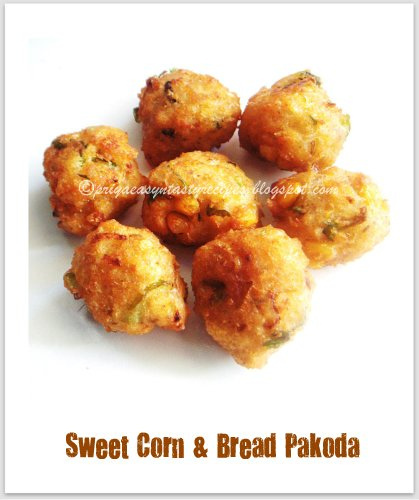 You see, I am from North Arcot Region of TamilNadu, a place well known for its unique dishes, like Makkan Peda, Arcot Biryani, Kuska Biryani, Arcot Serva to name a few. All of these dishes are tongue ticklers. Being raised a vegetarian, I can't vouch for the Arcot Meat Biryani as I never had the opportunity or inclination to taste it while growing up. But now, after having converted to an occasional meat eater, I wonder what's so special about the much-hyped biryani. But I have a feeling that all Biryani lovers would have a Biryani Blast! Anyways, today's featured menu is North Arcot Serva which tastes best with Kuska Biryani or Arcot Meat Biryani. 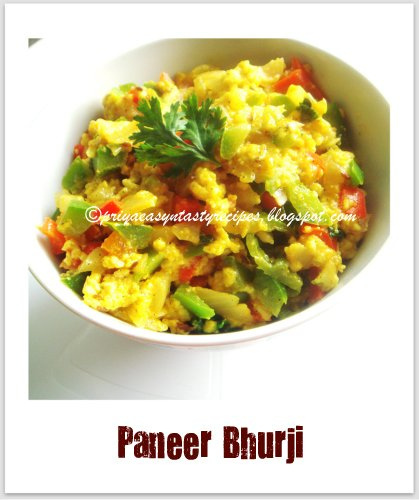 It equally tastes good with any Vegetable Pulav of choice. Add all the ingredients under "Masala Paste" in a small shallow plate. Combine the ingredients until a paste is formed. Quarter the eggplants with the crown intact.Smear a little paste on the insides of the quartered eggplants. Gently fry them in 2 Tsp of Canola Oil until they are browned on all sides. Move them to a plate. In the same pan, heat 3 Tbsp of oil and add the cumin seeds, fenugreek seeds and whole peppercorns. Fry them on medium flame for a minute or so. Add the coriander powder, turmeric powder,green chilies along with ginger-garlic paste and fry them for a minute or so. Add the finely chopped onions and saute till they are translucent. Follow up with chopped tomatoes and cook for a couple of minutes. Add little water and lid the pan. Cook till a gravy forms, approximately for 4-5 minutes. Add the browned eggplants and cook for 7-8 minutes. Extract a thick juice from the soaking tamarind pulp and add that to the pan. Add salt and check for taste. Now would be the time to add more chili powder or salt. 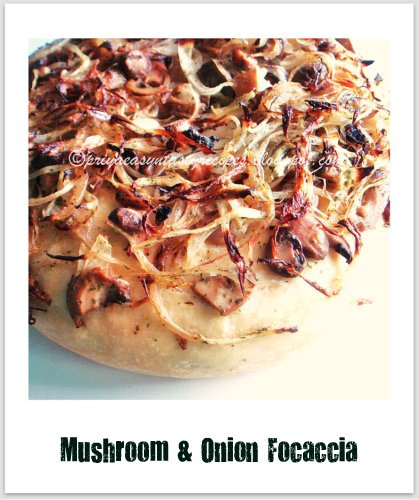 Lid the pan and cook a further 5-6 minutes. Optional Step: Toast the sesame seeds and peanuts. Powder them together and add towards the end of cooking. For tempering: Warm the Tsp of oil in a small skillet and add the other ingredients under "tempering" to the pan. Once the mustard seeds start sputtering,pour it over the Serva. Serva is now ready to be served with Kuska Biryani, Arcot Biryani or any Pulav with a side-serving of cooling "plain" Yogurt. Yes, plain Yogurt is better since the Serva packs quite a punch. As with any tangy dish, this side-dish tastes super good the following day. I know most of my fellow bloggers might have surprised to see my posts arent that much frequent recently, yeah i have a reason for it..We guys are leaving to India for a month tomorrow after a long, i am very much excited and happy to go to my country after many years, so friends i'll be leaving tomorrow and i'll be back only after 10th august..Dont forget to visit my space especially on 15th july for a special guest post from a wonderful blogger, do visit my space quite often even i wasnt able to reply you immediately,if time permits i'll go through your comments and definitely reply if you have any doubts regarding any particular posts.. 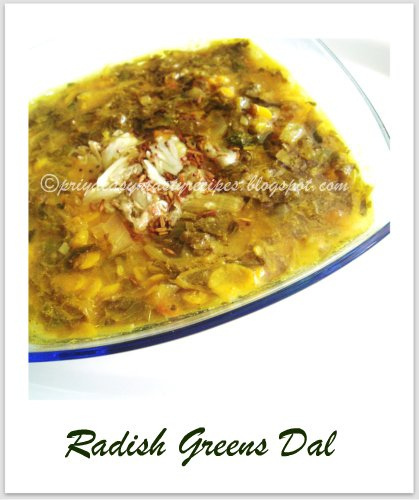 If you are able to get radishes with their greens, dont ever trash those greens anymore..You can very well use them for making dals or soups, i simply prepared this wonderful looking comforting dal with those greens,toor dal and with garlic cloves, we enjoyed having this garlic flavoured dal for our yesterday's lunch along with simple okra fry,both together turned out our lunch super filling,healthy and comforting..
Cook toordal with turmeric powder and chopped greens in pressure cooker upto 3hisses, add the chilly powder,salt and water,cook everything for few minutes.. 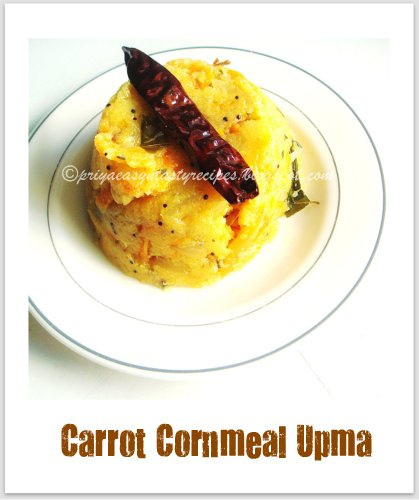 Serve hot with rice,papads or any spicy side dish.. Mix the sugar, salt and yeast in luke warm water, let them sit for 5 minutes..Take the all purpose flour in a mixing bowl, add the foaming yeast(add water if needed), one tablespoon of olive oil and mix everything well, its will be stickly at this point, transfer the them to lightly floured surface and knead for a while until they turn soft dough.. Coat a deep bowl with olive oil, place the soft dough, cover it and let it sit for 1 hour in a warm place..After an hour,the dough will almost doubled the size...put the dough in a round baking pan.Apply few drops of oil to the baking pan n press the dough to flatten them..Meanwhile heat a tsp of oil and saute the chopped onion, mushroom pieces together until the onions turns transculent, keep aside and let them cool..Gently spread this sauteed veggies over the dough and keep again for an hour in a warm place..
Preheat the oven to 350,place the baking pan in middle rack and bake for 20-25 minutes or else until the crust turns slightly brown.. Serve them with cream cheese, salads etc. 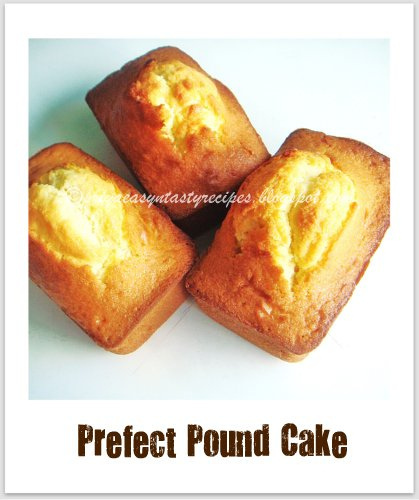 Our this month's Sweet punch challenge is this incredible pound cake..Its a simple but an addictive and super delicious pound cake everyone at home enjoyed a lot..This cake goes for easy ingredients and easy breezy preparation..This pound cake been choosed from The Cake Bible,where Rose has come up with a new method of baking the cake,very different from the butter-sugar creaming and wet+dry ingredients,the usual cake route.This method,according to Rose ensures a tight crumb,similar to that of Sara Lee Pound cake which is as perfect as a Pound Cake can be...Thanks to Rose for sharing this different way of preparing pound cake, yep it works out wonder and the texture turned out super spongy and super moist..I used six cup loaf mould pan for making this incredible pound cake which get vanished very much quickly once they came out of the oven..
Preheat the oven to 350F, grease the loaf pan or six cup loaf pan..Lightly whisk the eggs,milk and vanilla in a medium bowl, meanwhile take the dry ingredients in a large bowl,mix for few seconds, add the softened butter and half of the egg mixture,mix until the dry ingredients get moistened, beat in medium speed for a minutes, this helps aerate and develop the cake's structure, scrap down the sides..
Add the remaining egg mixture as two batches and beat again for few minutes,scrap down the sides and pour the batter into prepared pan, smooth the surface with a spatula and bake for 35-40minutes until a woooden toothpick inserted in the center comes out clean..
Let the cake gets cool completely and enjoy..
For making cake flour at home: Take one cup of all purpose flour and remove 2 tbsp from it.Replace the 2 tbsp flour with cornflour and sift together 2-3 times.Cake flour is ready to use. 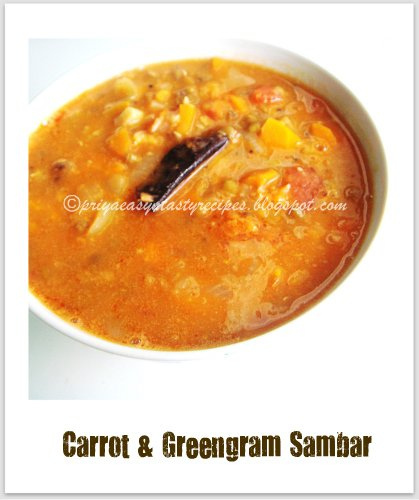 Whenever i dont have toor dal or yellow moongdal,i dont bother to use the whole greengrams for making sambar, this carrot and greengram sambar is one among those sambar..This sambar tastes mildly sweet,spiceless and nutritious to feed everyone at home easily, a wonderful sambar which suits prefectly to any ages..I skipped the sambar powder in this sambar and used simply slit opened green chillies and lemon juice to spice up this quick and easy sambar..Serve it with spicy potato roast,papads or with hard boiled eggs, am damn sure that your lunch or dinner will tastes absolutely divine, you can very well serve this sambar even along with hot steaming idlis or crispy dosas. Wash greengram well and pressure cook upto three whistles..heat enough oil in a kadai, add the mustard seeds, urad dal, red chillies,curry leaves, cumin seeds,asafoetida powder and let them splutters..
Now add the finely chopped lengthwise onion pieces n fry them well until they turns transculent, add the tomato pieces, fry them until they turns mushy.. Now add the green chillies and crushed garlic cloves, fry them for a while,add immediately the chopped carrots,saute for few minutes...now add the cooked greengram with salt and enough water, bring them to boil, put the flame in simmer and let them cook until the veggies gets well cooked..put off the stove finally add lemon juice to the sambar.. 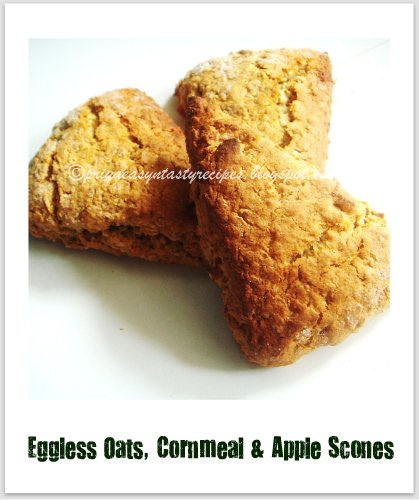 Serve hot with potato roast or hard boiled eggs..
As am not a breakfast person, my usual breakfast goes for a cup of coffee or tea with some cereal bars, but whenever i bake some scones or anything with oats i cant stop myself to have them for my breakfast, two days back i baked some scones using oats,cornmeal and applesauce as eggless,vegan breakfast scones and enjoyed having them for both breakfast and snacks, its quite an addictive,satisfying also healthy scones at the same time to enjoy without any guilt..My teddies enjoyed this scones when they were still warm.. A fabulous dairy free and eggless wonderful scones to enjoy even with any spreads for a quick breakfast.. Mix together quick cooking oats, cornmeal, all purpose flour, baking powder, baking soda, sugar, apple sauce, canola oil and chopped walnuts and turn everything as dough....Dust the dough with few spoons of all purpose flour..roll the dough with a rolling pin as a thick disc..with a knife cut the disc into 8 wedges..
Let them cool..serve them with coffee r tea..simply with any spreads..
Upma, a quick dish to prepare anytime of the day if you are in hurry, serve it simply with some coconut chutney or sugar i can have almost everyday, but am somewat healthnut nowadays and trying to avoid oily dishes quite few months, somehow my craving for upma kicked me to cook up something yesterday for our dinner, thats why i simply prepared this carrot cornmeal upma after a long...This upma gets ready very much quickly,since cornmeal are quite smaller when compared to our Indian rava, its gets cooked very much easily when compared to our rava...Also i used less water for cooking coz i used the fine quality of cornmeal for making this upma, addition of carrots gives a wonderful colour and a healthy touch to this simple upma..A wonderful,filling upma to enjoy either for breakfast or for dinner. Dry roast the cornmeal in a pan until a nice aroma comes out..Heat enough oil, let splutters the mustard seeds, urad dal,channadal,dry red chillies,fry until they turns brown, add now the sliced onions,grated ginger,curry leaves and slit opened green chillies,sauté until the onions turns transculent,immediately add the grated carrots and salt, cook for few seconds, add the water and bring everything to boil..
Add now the roasted cornmeal to the cooking veggies, stir continously until the cornmeal gets well cooked,put off the stove..Serve hot with chutney.. 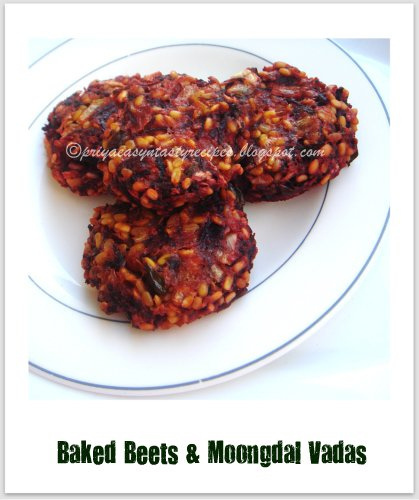 If you are craving for some vadas, its better to try this guilt free,quick and definitely healthy vadas prepared with grated beets and coarsely grounded moongdal batter, this vadas goes for baked version and its an oil less snacks to enjoy without any hesitation..Serve this vadas hot with some spicy coconut chutney for your snacks or either as side dish along with any sort of rice dishes, you will definitely enjoy this mildly sweet and spicy vadas...A wonderful vadas to enjoy anytime of the day and we enjoyed having them with some ketchup for our snacks..We just loved it.. 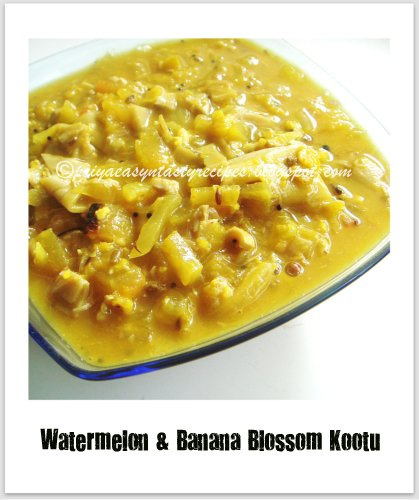 If someone says no to any particular vegetable at home, the next time i'll definitely prepare that veggie as kootu, personally i felt its quite a quick and best way to sneak veggies..Fortunately my picky eaters love kootu and this time i tried a rare and delicious combo for making kootu, i used the white part of the watermelon and banana blossom together to prepare this healthy,delicious and beautiful gravy along with a combination of moongdal and channadal, serve this kootu with papads or with any spicy meat dishes as side dish i can definitely say that you will have a wonderful,comforting and absolutely filling lunch or dinner, also since i cooked the veggies along with the dals, none will notice the veggies you used in this yummy kootu..We had this kootu for our lunch with some fried chicken pieces few days back and everyone at home just loved it..
Heat enough oil in a pressure cooker,let splutters the mustard seeds, urad dal, cumin seeds and asafoetida powder, add immediately the chopped onions and slit opened green chillies, saute until the onions turns transculent..now add the watermelon white rinds,banana blossom (strain the buttermilk), salt and turmeric powder, saute for few minutes, add the washed dals and enough water...Pressure cook upto 3 whistles..
Heat enough oil,lets crack the cumin seeds, add immediately the chopped onions, ginger garlic paste, saute until the onions turns transculent, now add the chopped green chillies, chopped bellpeppers,give a quick stir and add the turmeric powder, chilly powder, garam masala powder with salt, saute everything for few seconds, finally add the scrambled paneer,put the flame in simmer,cook everything for few minutes (keep stirring continously)..
Garnish with coriander leaves and serve as side dish..
You have loads of stale breads in your bread bag, bored of eating them as upma or toast, give a trial to this wonderful sweet corn and bread pakoda, am damn sure that this pakodas suits prefectly as a wonderful snacks or a side dish to enjoy along with rasam or curd rice, you have numerous choices to enjoy this cute looking crispy pakodas...Paris climate is getting better than few days back, its bit gloomy and prefectly best to enjoy these crispy pakodas for snacks with a cup of tea..This pakodas goes for a quick preparation and gets vanished really quickly too, serve it with ketchup or any sort of spicy chutney..
Take the grounded corn paste,soaked bread slices, cornmeal,rice flour,crushed ginger,chopped onions,chopped green chillies, curry leaves,fennel seed powder in a bowl and turn them as thick batter..Heat enough oil for deep frying, make small balls from the mixture and drop gently to the hot oil, fry until they turns golden brown.. Enjoy hot as side dish or for snacks..
Few days back i got a mail from Dhyuthi of Mélange, she wanted me to prepare a dish for Friendship Chain event, started by Anamika Arun of Taste Junction, since its sounds extremely important for me i immediately said ok and went on breaking my head to prepare something special and traditional from my native place, also personally i felt its quite a fabulous chance to showcase the food which we enjoyed thoroughly when we were kid.. The concept of this event is to choose a mystery blogger and ask her to prepare a special and traditional dish from her region and showcasing it also at the same time she have to ask an another mystery blogger to create a dish for her to post laterly, quite an interesting concept na...Reva of Kaarasaram choosed Dhyuthi for her mystery blogger,while Dhyuthi choosed me as her mystery blogger..Dont forget to visit my space on 15th July to check out my mystery blogger,yeah i have already choosed a wonderful blogger to continue this virtual friendship chain..Thanks to Dhyuthi for bringing out many memorable moments while preparing this Paal paniyaram, a delectable dessert from Chettinad region of Tamilnadu..
Eventhough i have been born and brought up in Pondicherry, a fabulous ancien French territory and a beautiful seashore cityy, i have been pampered with an ultimate combination of mixed South Indian cuisine and french cuisine..Love this diversity of cooking from my birth place and obviously my cooking style goes for this wonderful combination of many cuisines together... My mom,an incredible chef who never failed to prepare many dishes teached me her love for cooking,one among her signature dish is this Paal Paniyaram, this dish is quite well known in Chettinad cuisine and this sweet tastes super delicious when they are served warm or chilled..
Soak the raw rice and urad dal for 3 hours, grind as fine paste in grinder with enough water but as thick batter..Heat oil for deepfrying, once the oil is hot, drop gently the grounded batter as small balls, fry them until they turns golden brown,finish frying the whole batter as small balls and keep aside..